Kung, Bamenda area, republic of Cameroon. Looking back to the picture, nothing appears strange indeed. Perhaps, more often, we have seen pictures of people carrying loads of fruit, bread or books on their heads. A wallet seems so light and small that maybe this lightness is somehow surprising. As with everything, we can pause and take some time for something. Imagine we would walk around with our wallet on our head. Could that happen? Observing the picture, we might perceive a contrast between the modern, urban icon of the portfolio, and the rural, timeless idea of an African woman standing in front of her habitat. Why? When did we stop carrying things on our head? This picture seems to shape questions of comparison. Does this picture tell more about us, than about her? As with many otherwise trivial occurrences, something very ordinary conceals a door to a closet, and when we open that door we find a chaos of things that, before, we tended not to imagine. Nothing is strange, though there is no such strangeness as to believe that. Kung is a small village of about 600 people, perched on a steep hill in the Lower Fungom region, northwest Cameroon. Like any other village in the area, Kung has its own chief and its own language - a true language that should not be confused with a dialect. The language has no written form, and is endangered, although one of the community's central motivations is to safeguard its speech, so that the population can continue to communicate with their ancestors who have passed away. I suspect part of the answer to ‘When did we stop carrying things on our head?’ hinges uniquely on which group of people you’re talking about. For some cultures, they never did stop the handy, distinctly efficient practice of carrying bulky items on their head; for others, like some African-American women, whose ancestors came to America as slaves, they eventually stopped (for a variety of sociocultural reasons). Perhaps a corollary anthropological question, for yet other cultures, is not when did they stop carrying things on their heads, but rather why did they never begin? Is the answer as mundane as inconvenience and the availability of (preference for) alternative methods of conveyance suitable for where they lived and the activities they engage in — or is the answer more complex? I found this observation of interest: ‘One of the motivations to safeguard this speech is that the [Kung] population needs to learn this tongue to communicate with their ancestors that have passed away’. What might happen if modernity encroaches upon the Kung — as arguably it may, with the passage of enough time, in conjunction with the g-word: ‘globalization’? Such considerations as the intrusion of transformative technology, the secularist influences of popular culture, and the possible drifting away of young people might then prompt the Kung people to begin questioning whether any one tongue is uniquely necessary in order to ‘communicate’ with ‘ancestors that have passed away’ — or whether, to those ends, any language might suffice. In that hypothetical case, might ‘safeguarding’ the Kung’s tongue become less imperative, unfortunately putting preservation of the language at risk? And might that risk be even greater, given the language has, as pointed out, no written form? It seems symbolic to me, of the culture we carry within. On a London Street, she might look 'just the same', but for the wallet on her head. Ironically, it might not be safe on her head in London, while in Kung it is. Head porterage is an efficient transportation system, like you mention. In crowded places you move better when things mount in vertical axis. Some people are able to carry more than their bodyweight on their head, complaining that carrying weight on their back offers less oxygen (etc.). Still, in this particular situation of a wallet, all this does not make sense. You cannot divide the function from the person. In Morocco I see women that are not even visible by the loads they carry, however they refuse not to carry the load even when they are offered an alternative. Poverty would not explain why people do, or do not use head porterage. I think the answer is more complex. 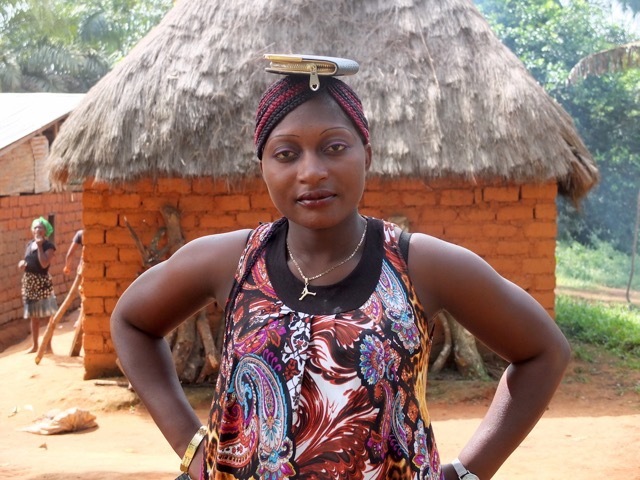 As for this particular woman choosing to carry her wallet on her head, even though it’s ‘light’, the explanation may be as mundane as ‘convenience’. Especially if her indigenous attire doesn’t provide pockets or if other go-to means of conveyance, like bags, aren’t available. I suggest that the juxtaposition of the 'traditional' (carrying things on one’s head) and of the 'modern' (a wallet being one of those carried things) marries those two aspects of her culture. As to whether ‘we would walk around with our wallet on our head’, I’d conclude that petty street crime would make that a dubious proposition in many cultures, including mine. As for whether ‘this picture tells more about us, than about her,’ I suggest the picture tells equally as much about us both. We’re quizzical about her, and if given the chance, she’d likely be quizzical about us. In being quizzical, both parties might be prone to walking away with misinterpretations — though ideally the net gain from the experience would, let’s hope, be two-way. Still, I think we are looking at this from a distance, in logical contradictions. Thomas his notion that it depends on the culture we carry within is significant, but does that vision mean we remain tied to an identity of contraries and are joined in disjunction? And then we feel it absurd, in that we imagine a small object can be kept in a fold of the dress or whatever. Yet that feeling reflects our own experience of carrying things on the head as being very uncomfortable, very unnatural. So yes, the image plays with cultural assumptions.